Make your home your favorite place to be on long winter evenings. September is a month of transition. There’s change in the air, a hint of color in the hills, and a sense of excitement about a return to familiar places and close company. It’s a time when we turn our attention to home and comfort, in preparation for the coming winter months. In celebration of this spirit of change and returning to home, Neil Kelly presents Fall Into Home, a month-long series of design and remodeling workshops for Portland-area homeowners. Whether you’re thinking of redesigning your home or simply making it more comfortable and energy efficient, Neil Kelly’s workshops will provide expert information, inspiration and advice to help you get started. From kitchen and bath remodeling trends and best practices, to whole-house remodeling and historic home renovation, to energy efficiency retrofits and solar energy systems and programs; the Fall Into Home Series will address a broad range of home improvement and remodeling topics, all presented by Neil Kelly’s experienced designers and home energy experts. In addition to the presentations and Q&A with Neil Kelly’s designers, workshop guests can enjoy cooking demos by professional chefs, wine tasting, and door prizes. Neil Kelly partners such as Keller Supply, BASCO, Pental Granite and Marble will be on hand to present the latest in products from Kohler, Grohe, Lapitec, Miele, and more. Fall Into Home workshops will be presented on September 12th, 19th, 24th and 26th at both of Neil Kelly’s Portland-area design centers; 15773 Bangy Road in Lake Oswego and 804 N. Alberta in Portland. The Series will also include special events at partner showrooms; September 17th at the BASCO appliance showroom, and an October 1 First Thursday event at the all new Kohler Signature Store in Portland’s Pearl District. The complete Fall Into Home schedule, including details and registration for all series workshop dates and locations, is available at www.neilkelly.com/events. 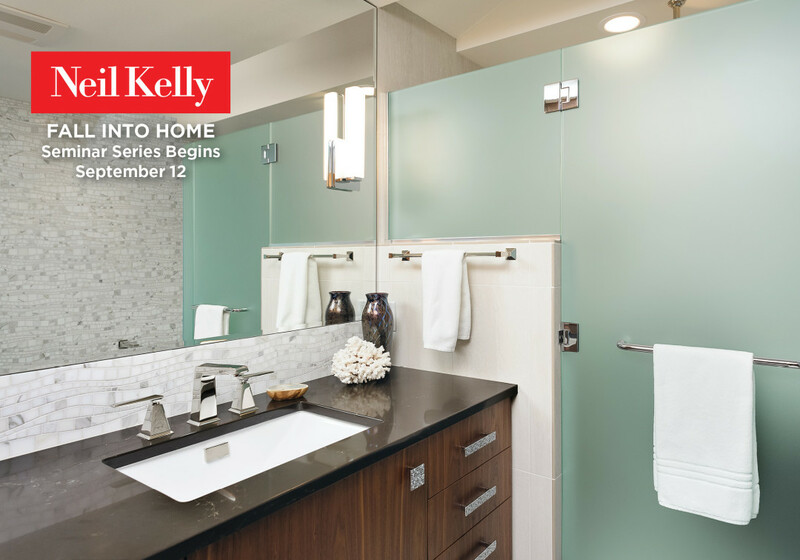 If you’re dreaming of a cozier kitchen, a more beautiful bath, or just a more comfortable and efficient home; you’ll find inspiration, information and fun at Neil Kelly’s Fall Into Home September Seminar Series. Neil Kelly Company, a certified B corporation, is an innovative residential design-build remodeling firm helping homeowners care for all aspects of their homes. Services include custom homes, award-winning design-build remodeling, energy upgrades, solar energy systems, and home repairs big and small. With five Pacific Northwest locations in Portland, Lake Oswego, Eugene, Bend and Seattle, Neil Kelly is renowned for its quality craftsmanship and sustainable building practices.